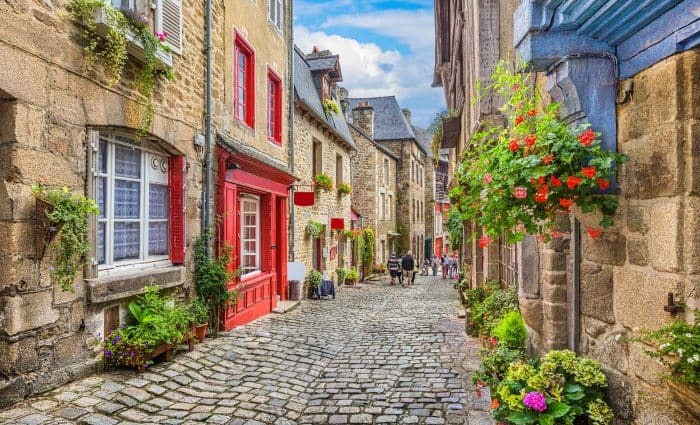 Situated on the English Channel along the coast of Northern France between Brittany and Picardy, Normandy boasts 360 miles of dramatic coastline with an interior of lush farmland, bustling market towns, and historic cities. 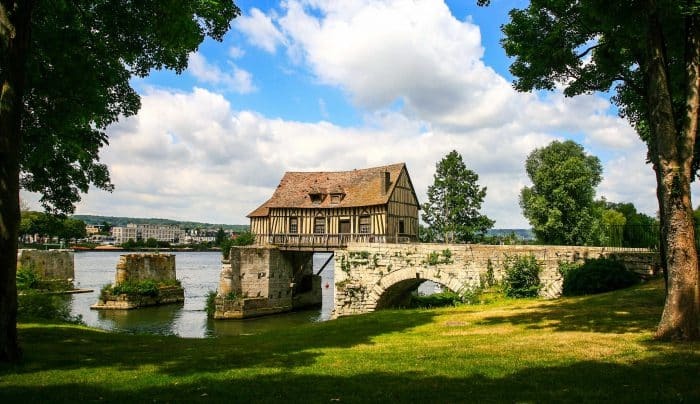 While a few of the towns maintain half-timbered houses and buildings that recall historic English architecture, much of the area was reconstructed post World War II and the massive invasion of then German-occupied Normandy in the D-Day landings. See medieval churches and Gothic abbeys, visit the beaches of the World War II landings, and experience the region’s superior cuisine of fresh seafood, fine dairy, and perfectly-baked homemade pastries. This morning, after taking the train two hours from Paris to Caen, pick up your rental car at the train station, and drive to your nearby hotel, a large and stylish property with contemporary rooms and a delicious restaurant. Caen, located in lower Normandy along the banks of the Orne, is one of largest and most historically significant cities in the area. Heavy fighting took place in and around Caen during the Battle of Normandy, and the city lost nearly all of its 10,000 buildings aside from the twin abbeys that William the Conqueror founded in the 11th century. Today, the city is largely modern with wide avenues and new apartment buildings. We will provide you with a suggested itinerary for a walking tour of the city. Be sure to visit The Caen Memorial–well signposted, and with its own exit off of the highway. The museum exhibits films, audio recordings, and photos covering the events that led up to the outbreak of World War II, the invasion of France, D-Day, and the Battle of Normandy. Dine at your hotel this evening or on one of Caen’s oldest pedestrian streets near the ruins of William the Conqueror’s 11th century fortress. Here, the chef serves up fresh regional cuisine, including grilled duck, king prawn risotto, and fresh berry pastries. You will be met in the hotel lobby this morning by your guide who will take you to the D-Day beaches where, on June 6, 1944, the Allies carried out their major offensive, reinforcing the turnaround of World War II. Although decades have passed abandoned pillboxes remain, the floating harbor endures and the museums document the events of the war. Just 30 minutes from Caen lies Bayeux, a lovely town filled with inviting shops and honey-colored stone houses lining narrow streets. An open market is held every Saturday morning at Saint Patrice, the quaint central square in town. Check into your accommodation, a beautifully maintained 18th century mansion, which offers elegant guest rooms and expansive gardens. For dinner we suggest a simple restaurant in Bayeux this evening, which serves inexpensive local favorites that include strong cheeses like Camembert, Livarot, and Pont-L’Eveque; fresh, local seafood; rich apple tarts; and apple cider and calvados (apple brandy). Once you’ve had some time to explore the city on your own this morning, you’ll visit the Musee de la Tapisserie de Bayeux, which houses one of the oldest surviving complete tapestries in the world. The Bayeux Tapestry tells the story of the Norman conquest of England in 1066. Afterwards, continue on to the Gothic Cathedral of Notre Dame, consecrated in 1077 in the presence of William, Duke of Normandy and King of England. You may also want to visit the Musee Baron Gerard, which displays porcelain and Bayeux lace. For dinner tonight we recommend a family-run restaurant which serves authentic French cooking specific to Normandy. Straddling the border between Brittany and Normandy is the rocky tidal island of Mont Saint Michel, one of France’s most beloved sights. Once a place of pilgrimage, then a fortress, and, in the 19th century, a prison, Mont Saint Michel towers 150 meters above sea level and has a current year-round population of 41. Depending on the tide level, the island is either surrounded by water or marshlands. Upon your arrival on the island, hike the cobblestone streets to the 12th century Benedictine Abbey, a remarkable Gothic complex with a maze of rooms, hallways, and staircases. While the climb to the abbey is difficult, the dramatic views of the bay from the top are well worth it. Bring a picnic lunch from Bayeux today, and enjoy your meal along the Promenade des Remparts. Mont Saint Michel is France’s most visited destination outside of Paris. You will stay overnight on the island, giving you a chance to further explore the narrow and winding streets during the quiet hours after the day-trippers have departed. Your accommodation is at a well-known and historical hotel that offers panoramic views of the village, surrounding gardens, and the bay beyond. Dinner is included this evening at your hotel’s panoramic restaurant, set at the foot of the Abbey of Mont Saint Michel, with a view of the bay and its incredible, tides. Return your rental car today in Granville (45 minutes), and return to Paris on a three-hour train ride. Alternatively, return your car in St-Malo (50 minutes), and continue on to Northeast Brittany.